The older, less maintained parts of the Waikumete Cemetery are covered with this grass: Himalayan Fairy Grass (miscanthus nepalensis). Like many pretty things, it’s classed as a weed (invasive, clumping). Here the fluff in the sky competes with the fluff on the ground. 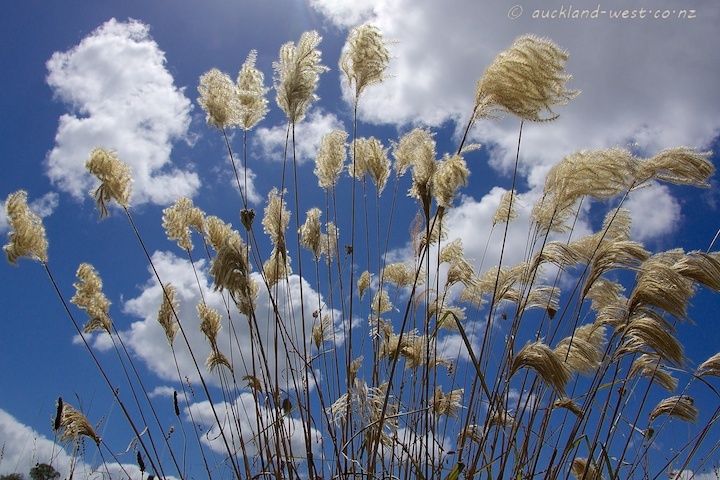 It may be a weed, but it looks grand against the blue sky. Very well composed picture. Fluffy indeed! Some so called weeds are lovely member of any landscape, thanks for sharing these with us on SWF! Love this picture of natural beauty. Good composition and perspective. The grass looks fantastic against the sky. Beautiful shot!